The girls (and so did I) wanted to go to Knotts Merry Farm during vacation. The girls love the rides, Snoopy on Ice and the dancing lights in the evening. 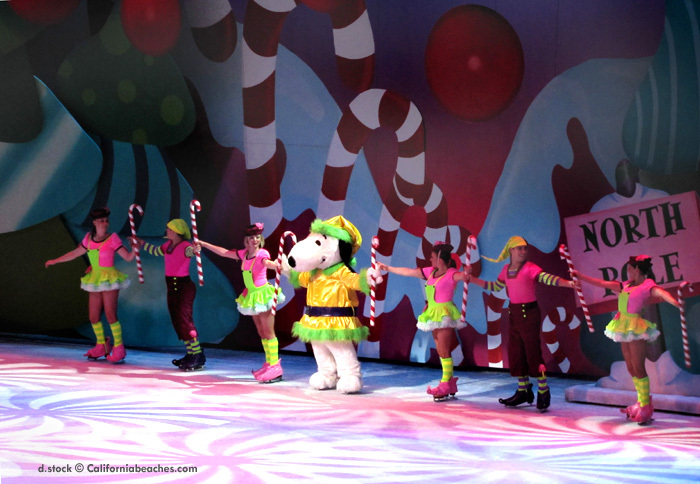 I love it for Snoopy on Ice and to watch the Christmas Carol play they have every year. All the light in Camp Snoopy are fun to look at too! I found a good deal for tickets on ebay, where we got 4 of them for $70! It was a lot less crowded this year than last which was really nice. I think the longest we waited in line for a ride was about 20 min. We happened to be at the right places at the right times to see all the Peanuts characters and get pictures with them. Because of the crowds being light, we squeezed in a Peanuts character show and saw the holiday parade. The parade is pretty sad compared to Disneyland. The music is played from one float that is in the middle of the parade and a speaker that was really far away. 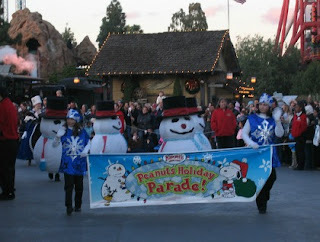 The parade members were full of smiles and all the characters came out or by floats and got the job done. The girls and I enjoyed the parade. I much rather see Peanuts characters than Disney characters any day. We got on all the rides we wanted to do and saw all the shows we wanted. We closed our day by looking at the lights in Camp Snoopy and the girls danced around the dancing ground lights of snowmen, bells, and snowflakes as we headed for the exit.